On 26 April 2015 I found myself among over 37000 other runners at the start line of the Virgin Money London Marathon for what would be the best marathon experience I've had so far. Along with most other runners, I arrived with great aspirations of a massive PB and my own goal of running sub-2:45. Boy was I wrong to think this was possible on my first attempt at London. As I had such great success at the Abingdon Marathon back in 2013 I stuck to using the Hansons Marathon Method for this race, but with a much more ambitious target pace. With four months of great training and a few fast build up half-marathons under my belt I arrived at the "Fast Good for Age" start area, right at the front of the red start, with plenty of time and confident in my ability to run a great race and dip under 2:45. The cool overcast and almost windless conditions added to this confidence - it was perfect marathon racing conditions for me. At 10:10 the fog horn went and we were off. The race started with a bit of meandering through the suburbs with a relatively thin stream of spectators cheering us on. Keeping to my desired pace was easy here. At about 4km the crowds started to noticeably thicken and by 5km when the red and blue/green fields merged the crowds were thunderous and incredibly motivating. I knew there would be a lot of spectators along the route, but I didn't expect them to start so soon into the race and be so excited, numerous and motivating. Other than a few areas around The Isle of Dogs, most of the route was at least two to three people deep on each side of the road. Tower Bridge is particularly amazing and motivating… and deafeningly loud. This proved to be my downfall. I got so caught up in the cheering from the crowds and the whole exciting atmosphere that I found myself arriving at half-way nearly 3 minutes ahead of schedule and as we all know, starting too fast will never end well, and that's precisely what happened to me. Just after the 32k mark the wheels started to come off and my pace dropped dramatically. I had a particularly terrible section through Canary Wharf but thanks to the immense crowds I held on and came out of the slump and managed to finish in a respectable time of 2:53:34 - a 16 second PB. Normally I'm the one doing the overtaking, not being overtaken. 247 people passing me isn't a lot in the grand scheme of things, but it does equate to nearly 25% of the people who finished ahead of me. The London Marathon was a brilliant experience and a race I'll definitely be doing again. 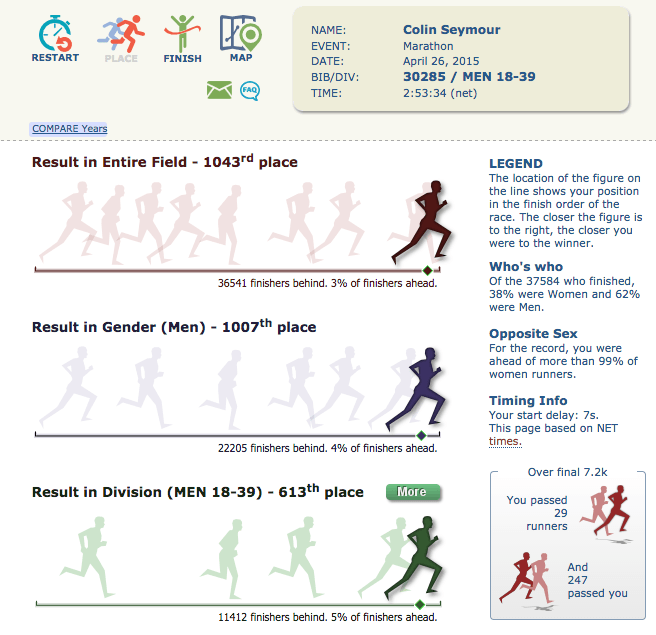 I'm really pleased to have run this race and experienced it and more so because, despite the wheels coming a bit loose, I still managed a personal best. My finishing time qualifies me for a "Good for Age" entry again next year, but I think I might give it a miss and try a different and smaller race. We'll see. Now to find a fast autumn marathon in which I won't get distracted by the crowds so I can have a good go at that sub-2:45 goal.